11 5/8 by 8 5/8 in. This extraordinary portrait is one of two portraying a Bisharin warrior, ordered by the American art dealer Samuel P. Avery (1822-1904) from Gérôme in 1871, while the artist sought refuge with his family in London during the siege of Paris. Finding himself without a satisfactory model in that city, Gérôme completed the pictures once he returned to Paris. (As Avery noted in his diary on May 6, 1871, “Gérôme accepts order to paint me pair of heads 8 ½ x 10 ½ at 4000 each to be done on his return to Paris.” The other picture, ultimately somewhat larger but depicting the same model and also dated 1872, is now in a private collection.) An Arab “head” was picked up by Avery’s Paris agent, George Lucas (1824-1909) in early 1873, who framed it and sent it on to New York; this may be a reference to the present work. A combination of ethnography and favorite studio props - photographs of Gérôme’s workplace show a virtual library of Middle Eastern souvenirs, architectural fragments, and unusual artifacts, including kaskara swords and at least one hippopotamus-hide shield similar to that in Bisharin Warrior mounted high on the wall – these images also demonstrated Gérôme’s unique ability to individualize figures of a racial type. 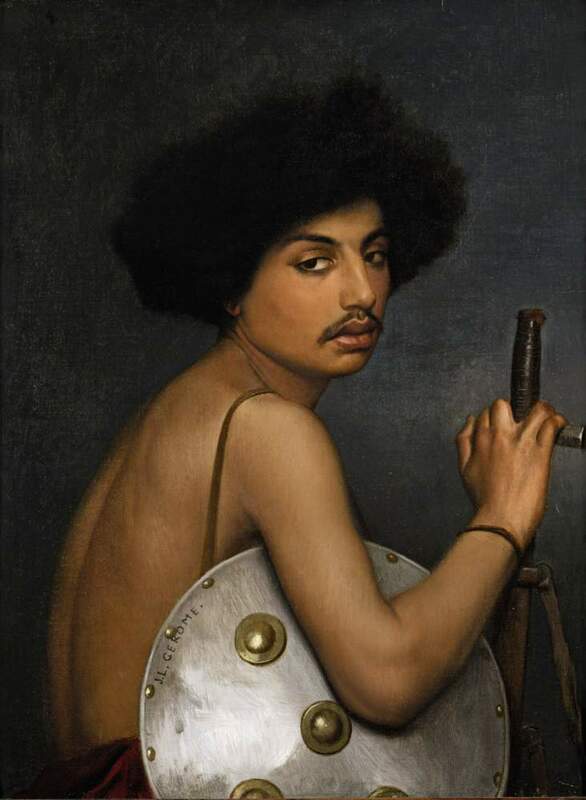 As one writer noted, “Gérôme’s picture is one of those fine portraits of his own where he reveals individual traits through his intellectual understanding of racial characteristics . . . Never did Gérôme paint a finer bit of genre than this young giant,” (Lorinda Munson Bryant, French Pictures and their Painters, New York, 1922, pp. 104-5). A third portrait of an Arab “head” painted in this year, this time of a black servant girl (private collection), suggest Gérôme’s intense interest in this project, and the confidence he had in its widespread appeal. Native to Northeast Africa, the nomadic Bisharin were admired in the nineteenth century for their round faces, straight noses, full lips, and large eyes, all of which are emphasized in Gérôme’s work to great effect. (Today this nomadic Sufi Muslim tribe is known principally for its skill at farming and animal husbandry.) The curve of the model’s back, reminiscent of Ingres’ sensuous odalisques, is echoed by the curve and ornamentation of his shield. Though he is equipped with the tools of war, his splay-fingered grip is not convincing; this adolescent boy, with his heavy eyelids, sensuous lips, juvenile moustache, sidelong glance and graceful twist, is surely more beauty than bite. The remarkable provenance of Bisharin Warrior includes several of the most prominent collectors, independent galleries, and museums in the nineteenth-century American art world. Its deaccession by the Metropolitan Museum of Art in 1956 was a direct response to the rise of Abstract Expressionism and figure painting’s fall from grace; its volatile history, then, reflects that of academic art in America, adding art historical import to the work. Gérôme’s memoirs indicate that he encountered the same difficulty with other works at this time, including The Moorish Bath (Museum of Fine Arts, Boston) (see Gerald M. Ackerman, Jean-Léon Gérôme : monographie révisée, catalogue raisonné mis à jour, Paris, 2000, pp. 92, 272). Gerald M. Ackerman Archives, folder for Bisharin Warriors, typewritten note, November 11, 1979. In the urban setting of Cairo, Gérôme took a particular interest in elaborate depictions of the Arnauts, descendants of the Albanian soldiers brought to Egypt by the Pasha Muhammad ‘Ali (ca. 1769-1849, r. 1805-48), and their most colorful division, the Ottoman irregular mercenaries known colloquially as bashi-bazouks (literally “damaged head”, meaning leaderless or without discipline). These military subjects were the infamous remains of a fearsome force that Muhammad ‘Ali had decimated years before, in an effort to consolidate his power. Gérôme’s portraits of these soldiers, often glossed with an element of humor or subtle derision, would form a distinctive and popular subgroup within his Orientalist oeuvre after 1867. As Ellen Strain and others have noted, the field of ethnography was only loosely defined by the middle of the nineteenth century, and bordered on anecdotal or popular knowledge (Ellen Strain, “Exotic Bodies, Distant Landscapes: Touristic Viewing and Popularized Anthropology in the Nineteenth Century,” Wide Angle, vol, 18, no. 2, April 1996, pp. 70-100). Gérôme’s efforts to faithfully record the features and costumes of those he encountered first-hand during his travels stand as noteworthy attempts to elevate this practice to science. The artist’s other major painting of this year, the epic Pollice Verso (Phoenix Art Museum), though also rigorous in its carefully researched detail, followed a different philosophical and artistic trajectory.